Cut yam into 1 inch circular disks and cut circles further into semi circles or finger slices as preferred. Peel the back/skin off the yams. Place yams in salt water as they are peeled (this prevents them from turning brown while you cut up the rest). Strain water from peeled yams. Sprinkle salt to taste on yams. Heat up oil in frying pan. 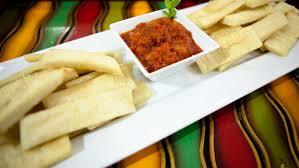 You can also use a deep fryer to fry the yams. The settings for yams in a deep fryer would be the same for chips. 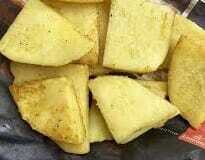 Once oil is hot, place yam slices in pan and fry each side till you get a hint of golden colour. (You can fry it a bit more if you prefer it to be very crispy). Serve as side dish with beans or stew. You can also use as a main dish with eggs for breakfast.